The New Zealand Arapawa Goat Association (NZAGA) is made up of a group of people from around the world who are passionate about the survival and welfare of this beautiful, critically at-risk breed of small goat. Arapawa goats are considered by the American Livestock Conservancy to be one of the rarest goat breeds in the world. With fewer than 500 recorded world-wide, they are critically close to extinction. 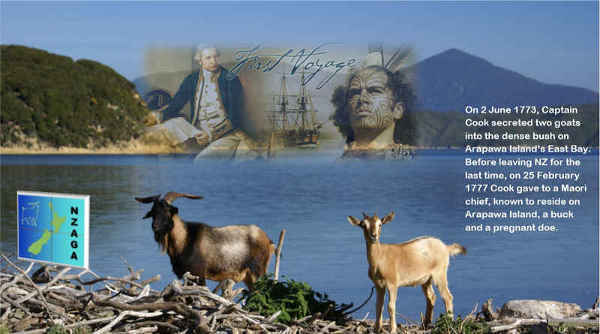 Isolated on the 75 square kilometre island of Arapawa in New Zealand’s Marlborough Sounds, there is historical evidence to support the claim the Arapawa goats are direct descendants of three breeding pairs released during Captain Cook’s second and third voyages to the Southern Ocean. On 23rd May 1773, Cook and Furneaux gave a doe and a buck to Maori who resided at Grass Cove on Arapawa Island. Under the pretense of collecting antiscorbutic grasses, on 2nd June 1773 a second pair – a fertile doe and a young buck – were secreted into the dense bush of Arapawa Island’s East Bay by Cook, Furneaux and Georg Forster. A third pair, the doe already in kid, were given to a Ngai Tahu chief on 25th February 1777. This was Cook’s final voyage and his last gift to the NZ people. Fifty years later the goats were observed by the first whalers when they arrived on Arapawa Island in 1827. The goats lived undisturbed on the island for another one hundred and fifty years. Because the goats were feral and genetically isolated over a long period, they adapted to the ecological environment and evolved into a unique breed. Recent DNA evidence, using 50K SNP chips, links them to an unknown South African origin which supports the historical evidence that the Arapawa goats are descendants of those given to Maori in 1777. However the Old English connection cannot be ruled out until a direct comparison is made with the now extinct unimproved old English goat. What we do know is the Arapawa goats have no future on Arapawa Island. In the 1970s they came to the attention of the NZ Forest Service. Determining the goats were pests and destructive to the forest, despite the efforts of Betty Rowe, an eradication programme commenced which continues today under New Zealand’s Department of Conservation (DOC).